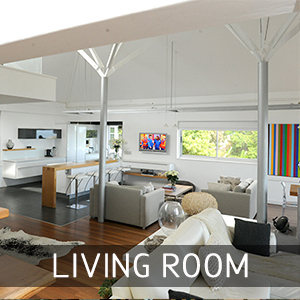 A living room can serve many functional purposes, depending on the design of the house. It may be a formal seating area for guests or it could be the main family room offering rest and rejuvenation. The living room in a home can tell many stories. It sees all of the birthday parties and casual evenings of relaxation. It also welcomes guests as they arrive, and quietly hosts every visit. Many entrances transition into the living room, so it is often the first impression of a home. The design and décor should be striking and inviting, and it should always inspire conversation. It should encourage guests to stay and visit. As you contemplate different living room designs, you should also consider the main purpose of the room. The style of the living room should set the tone for a coherent flow throughout the house. It should facilitate relaxation and open communication. Living room design should utilise natural light to lift the spirits and accentuate focal points. Various lounge décor, such as oversized furniture and multiple textures, convey warmth and contentment. Small spaces can be utilised to showcase cultural pieces and smaller focal points, while rustic earth tones and clean white lines help diversify the aesthetics of the room. Architectural accents like built-in book cases, crown moulding, and bulkheads add the illusion of extra space and allow colours to reconfigure the room. There are an infinite number of living room décor ideas to marry casual comfort and personal style. With all of these things in mind, we can help recompose your living space into an area that flows smoothly into the rest of the house. An airy base with clean lines and accenting textures offer a charismatic approach to showcasing your home’s fabulous disposition. There are so many options to upgrade your home’s finest room into a living space that is utterly remarkable.